For those wondering, Protect Our Trout was alluded to first waaaaaaay back here. Making up fake search engine results is trickier than I thought. That paranormal weekly article is a blue link. Looks like Theo left the desk a little early. It seems like he has hit the nail on the head, but they are right in that the secrecy part doesn’t add up. Selkie wasn’t exactly hidden away. From humans, at least. There is also that fish person working at the hospital Andi called. Maybe Dr. fishman is the fishman from that link there, and is looking for Selkie for evil purposes. Maybe there was a revolution and Selkie’s parents were important people and were killed and now they want Selkie dead too. Sure, but think of this: If Selkie’s people are government protected, what about half bloods? Laws take time to catch up with new things–look at the legal mess new technologies bring with them. Perhaps full blooded selkies aren’t allowed to leave their quarantined city, but half bloods can be snuck out? Perhaps half bloods have completely different laws about them. If you know anything about the law surrounding native americans and their bloodlines in america today, you’ll know it’s alot more plausible than it sounds. The reservations aren’t even considered part of the states they are in, and have completely different laws inside them. Native Americans can be subject to both the laws of their people’s nations, and american federal laws, while on their own land. And the aid or leniency a native american can expect from the government–their own or the american government–often comes down to what fraction of their blood is of their own native tribe, what fraction is from other tribes, and what fraction is from non-native bloodlines. It’s a mess, and that’s just for native americans–imagine a similarly complicated lunacy applied to a new species. So why didn’t you just type “Fish People” into Google? It actually comes up with what looks like a very usable search result page for your needs. “Fish People Wiki” brings up some Wikipedia pages too. Somehow I doubt that Selkie´s mom, before or after the clean-up, would be mistaken for a merMAN. This reminds me of an Art Bell Show story concerning night hunting Texans who shot a large hominid (Bigfoot). By the light of the next day, they regretfully realized just how human it appeared, and swore the carcases burial site to secrecy. A sad story… but at least they had the good sense not to clean and filet it. Um, bigfoot (sasquatch) is from Northern California, not Texas. Um, Bigfoot (Sasquatch) is from a whooole bunch of places. I was not aware of that. Upon further research, it appears that most of the sightings outside of the Pacific Northwest are within the last 20 years, and I left the area before that, so I have to plead ignorance. I have Native American friends that have legends of “wild men” that are pre-white man. 10 years would likely have given him the time to get a medical license (I imagine he was already familiar with medicine to some extent before leaving Atlantis), and would’ve given the hospital staff plenty of time to get used to working with Dr. Innsmouth. So the city is somehow a more sensitive issue than the mer-people themselves. Great… now I have to go through the comic page by page to check if there are any inoccous lines that could actually be foreshadowing. darcos0> We do it all the time in SHARDS but most isn’t revealed as of yet. I have a Word Document that keeps track of where we’ve put all our clues;) No one see is but me though. All shall be revealed in time! There are a few in last week’s strip. I’m still waiting to see if anyone gets them all. Do you guys remember the time Wisconsin tried to claim the name “the mitten state” and were saying they’re shaped like a mitten? There’s all sorts of merchandise now that says “Don’t mess with the mitten” now because of that. I like that the city is in Michigan. Say yay to the U.P. eh? better yet, and this could be betraying my age, but do you remember when some group decided they didn’t like being called “Michiganders” and thought we should be referred to as “Michiginians”!?? Half expected that to be a PETA link. Though.. I always assumed it was in Lake Michigan with the whole great lakes triangle and all… meh.. I was close. Last search result — yep. the same year they passed POTA. I really REALLY hope Selkie never sees that photo! Third one down from FISH ARE PEOPLE AND SO ARE DOLPHINS! That’s the one, right? Ah, I see. Yep. I wasn’t the first to find it. Maybe he wanted to find more recipes they can try with Selkie. I think that was my favorite part of this strip. I don’t actually ‘scour each strip for clues’ (ha! everyone else does that, that’s why I read the comments ;)) but am a total sucker for bits of text and things like that in any media. Recorded TV is THE BEST because I stop on every list of names/love letter/newspaper article/etc. that just gets flashed across a screen and read every bit of it I can. I think that he might have looked up that link when they had that fish dinner at Todd’s, when they discovered Selkie loved fish eyeballs. Sometimes searches with a certain word in them will bring up something related to the word, but unrelated to the search. Fish-people, a fish recipe. 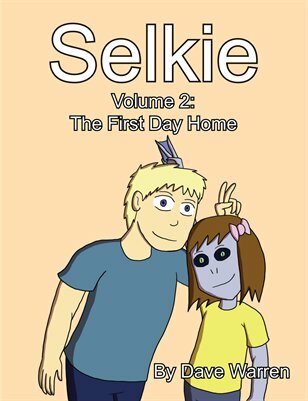 Selkie was born on May 24, 2002, little more than a month after the date in the link. …maybe it was her dad. Maybe that’s why her dad wasn’t in those flashbacks. That or her culture has the female raise the children alone. Selkie would probably really enjoy that sea salt and lemon fish fillet. Maybe not. Lemons are fruit. Are Selkie and the doctor exiles? Would Lacustrianopolis not welcome them back? Or Dr. fishman is looking for Selkie to kill her for being a princess or something. Please say I’m not the only one who noticed Bugle. I lol’d. The last link is a tragedy. It is very typically human to do something like catch a “merman” and then kill it, but it also makes me very angry. I haven’t even read the article or seen the undoubtedly grotesque picture that will accompany it – and I am still very, very mad. And I’m also surprised; if that is the event that triggered the POTA, and it comes up so readily on the search, I wonder why the government hasn’t erased it. Todd’s mom is right – if this is true, the government is doing a really, really TERRIBLE job of hiding this! I feel really bad for that merman and his family. I have a hunch that he might have been Selkie’s dad, but we really have nothing to go on at this point, other than that snippet of an article, Selkie being born well under nine months after his death, and the fact that Selkie doesn’t seem to remember her dad in those flashbacks. According to this strip https://selkiecomic.com/?p=190 she’s eight. 2002 was ten years ago. Either I’m confused about what year this strip is taking place in, or your math is a little off. 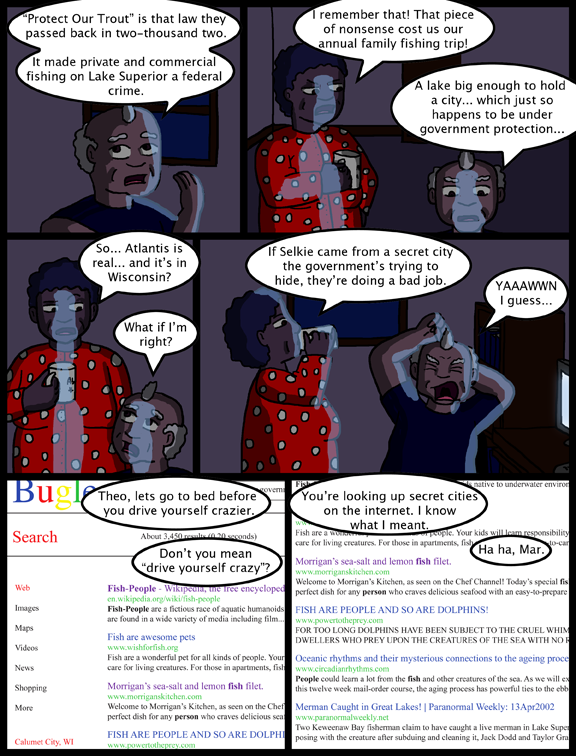 I started running Selkie back in 2010, and I try to keep the comic consistent with the idea that it’s events started/are taking place in 2010. Since real life moves faster than I can tell this story though, it’s been two years for us and about three to four weeks for the crew. Eventually I am going to have to do some time skips to get the comic’s chronology moving forward but for right now events are just flowing off each other. I know one day I am going to mess up my timeline, but I think I’ve avoided anachronisms so far. I was thinking the other day about why the government would leave a possible alien in an orphanage, wouldn’t Selkie have been whisked away to Area 51? Maybe the government & Selkie’s people are working together to put us to such a test.